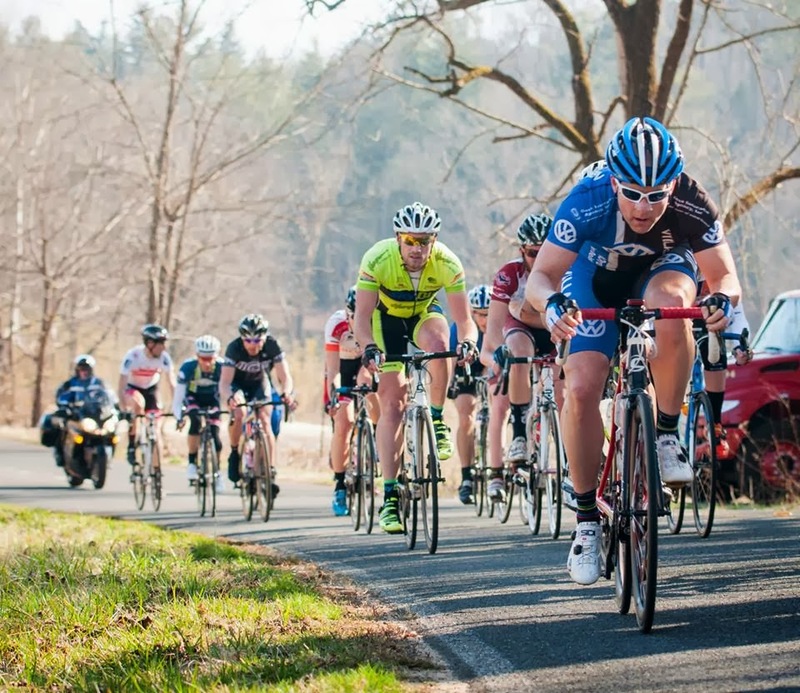 Last week I joyously blogged about (some of) the glories of bicycle racing. I was on a euphoric high having won my first cat 3 race. No doubt about it, I raced smart and executed well. I was rewarded with a win at the finish line. Those are facts I can't argue. Nor can you. Now this most recent week I wanted to try my hand again. The course this time would be 9 loops of a ~5.5 mile course with a wicked power climb at the end of each lap (.6mi @ avg 6% gradient). My plan going into the race was the same as last week, although the populated-with-collegiate-teams start list was a bit more intimidating than last week. Right in the first loop I noticed problem #1 with my strategy: there was no room to move up anywhere on the course. The roads were relatively narrow, the field was huge, and the route had a fair number of curves and twists. As a consequence, the lane was full the entire race (even later on up the climb). That was my mistake at the beginning, setting myself up at the back. I had figured it would be like last week with plenty of opportunities throughout the race to move up in the field. I was sadly mistaken. Then, we got to the final climb. The first time up and over it was 2:14 of 391 watts. That's a lot of juice. But, I thought to myself, I've done ~20' worth of VO2 watts before (350ish), surely the pace will drop and I'll be able to move up...right? Well, lap 2 came around and that was not the case. The wattage dropped a bit but the combination of yo-yoing on the back of the group (my own fault due to placement) and the resulting sprints/spikes in power and the hill was doing some serious damage to my legs. Laps 3-6 passed uneventfully other than the extreme pain the climb was causing me. At one point we were going downhill (fairly quickly) and I watched a guy ~20' in front of me grab a bunch of rear brake on a right hand bend and go cartwheeling down the hill. He bounced back up at the end of the crash but was clearly disheveled. It wasn't tough to avoid it but it made me a bit nervous about the size of the group and the narrow, fast turns. Later the P12 field came by us and the motos forced us over to the right side of the road, which caused a pretty big pile-up in the middle of the field. Worth noting, the moto refs were in the right but it would seem that people weren't paying enough attention to get the job done and get single file without cutting each other off. They even, once the field passed, forced us into a stand-down for 1.5-2 minutes (a couple of guys peed). I've never had that happen in a bike race before. Once we were coming over the top of the climb with 2 laps to go I was getting dropped a bit over the top of the climb and was catching back up with some others on the downhill/flat section. It was clear to me at this point that just finishing was going to be my goal unless I could find a sterile but discarded epi pen lying somewhere along the route. So basically that was the story; over the top of the penultimate ascension of the climb I just noodled up and crossed the line. Somewhere well back of the front group. I had managed to get in a great workout, fried my legs, and quelled a lot of my desire to do a bunch of bike racing this year. All in all, I'd consider that a win! Other than that it was a good week. Consistent training with some fantastic weekend weather leaves me tired but ready for more.